Aline has been in business since 1932. We are located in Los Angeles County, 30 minutes from LAX airport. Aline is a leading manufacturer of Thermal Impulse and Vacuum Seal equipment. Our expertise ranges across all industries and allows us to assist you in determining the right solution for your application. Our product mix is highly varied and both standard and custom equipment are available. Having the benefit of this expertise we are now the only US manufacturer who can offer industrial quality sealers for the window shade industry. Each machine is manufactured with heavy duty welded steel for the frames. Side plates are one inch thick steel. All seal bars, clamp bars, tucking bars and indexing bars are either Aluminum bar stock or Stainless Steel. Machine finish is Powder Coat. Operating controls include a network capable PLC/HMI with unlimited recipes. This allows the user to program the required set points for all your different materials. 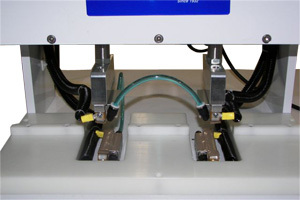 With speed being critical each machine can perform at 2-3 cycles per minute when incorporating the water cooling option. Motorized rollers can also contribute to productivity and ease of use. The standard weld size is ¼ inch (6mm) includes both top and bottom heat. Wider or narrower heating elements are available. Complete trouble shooting screens for all I/O’s with JPG. Photographs. Options for both machines include motorized rollers, bars drilled for water cooling and digital water chiller. Dual Side welders are offered so that you can close off the ends of the pockets after inserting your stiffening rod. 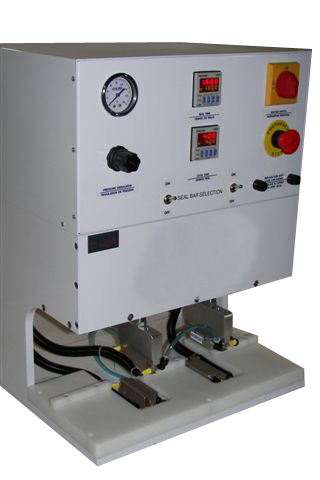 If a Batten & Seam welder or Auto hem Pocket folder is not required we can provide a simpler heat sealer of almost any length. All Aline Machines come with a ONE YEAR WARRANTY, electrical schematics and full time technical support.